this music as any have ever been. Those vocals are owned by Chris Porter the hugely talented singer songwriter from ‘Back Road Baptists,’ whose ‘Broken Hearts and Bad Decisions’ album was given four stars here a couple of years ago, but has since gone up even further in my estimation. I don’t know if the Baptists are still a band but if not this tremendous trio more than suffice. Porter’s raw, gravelly and relaxed drawl has a powerful ‘Hillbilly’ twang and could easily be imagined to have been plucked from a hotel recording session in the 1920s, in addition to which he is a talented guitar and dobro player. The beautiful female vocals that contrast so well with Porter’s are courtesy of Helen Gassenheimer and despite the fact that she doesn’t sing lead on the songs is perfectly placed to give lift and variety of tone to these evocative tales. She is also a quite extraordinary fiddle player whose talents at times give a dominance and quality to some of the songs that most can only dream of! Eric Ominus’s contributes much with his backup vocals and his double bass brings a powerful presence to the album that underpins the talents of Porter and Gassenheimer, allowing them full rein to explore the powerful stories and to stretch their virtuosic skills. 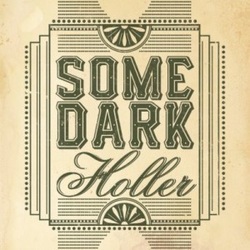 The instrumentation is acoustic and sparse, allowing Porter’s atmospheric vocals to paint the picture, with Helen’s beautiful harmonies and occasional lead bringing an even greater degree of drama to the mainly dark tales and whilst all can be applied to suburban life, the vocals and instrumentation constantly evoke a front porch in a ‘holler’ of old. The scene is set by album opener Bar Tabs, a slow moody tale of lost love with a hauntingly eerie harmonica, metronomic bass drum thud and deep twangy guitar, followed by a song that at first seems easy going but is actually anything but. Cry For Me is an an emotive tale of an itinerant musician drinking himself into oblivion, on a song that blends with the classic ‘Wayfaring stranger.’ Porter’s usual gravelly, raw but expressive vocals contrast beautifully with the lovely female harmonies with the atmosphere further darkened by the beautifully played mournful fiddle on an incredibly powerful story. Next up is a fiddle, dobro, bass and percussion introduction on a song that has a feel of ‘The Band’ that at the same time calls up an old time ‘hillbilly’ atmosphere on a tale of someone who finds his sorrows difficult to cope with without that Sweet Red Wine. The title track Hollow Chest is a harrowingly dark murder ballad with Chris Porter’s atmospheric vocals creating a deep darkness on a song that is in some ways made more spooky by Helen Gassenheimer’s gorgeous vocals on alternate verses as the angelic murder victim, with a heavy bass thrum accompanied by the mournful fiddle and guitar. Yet another exquisitely powerful, atmospheric tale. Hell Or High Water is led by an acoustic guitar, fiddle and piano on another slow moody song that this time has a gospel feel on the chorus. This is another incredibly dark sad song that is anti war but at the same time tells of the resilience and sheer harrowing sorrow of those left behind. This is a song that whilst not actually mentioning a‘hillbilly’ environment, again evokes that feeling. It’s easy to picture the mountains and a cabin home that is all that is left of the lives of families that found it hard enough to survive before the death of the men folk in yet more pointless wars. Finally comes a powerful tale based on a short civil war story by Ambrose Bierce. Owl Creek Bridge is an evocative tale of a man hung from the bridge by the Union army for helping the Confederates in an attempt to blow up the bridge. It seems he survived the hanging but in a story of twists, nothing is ever as it seems! This is a brilliant album that with each listen seems to reveal more little nuances. The stories are powerful and the instrumentation both evocative and perfectly selected but it is the two disparate vocalists that lifts the album to a level that few can emulate, much less improve on. On first few listens I thought it would be worthy of a good four stars, but having now listened to it several dozen times have no compunction in giving it a full five stars. That being the maximum, the only problem will be if it goes up even further in my estimation. It really is that good!